Experience of research and other scientific activities: I am a philosopher of law (&state) and conduct cross-disciplinary research. I got my Master of Law (July 2004) and Doctor of Law, in Legal Theory (April 2009), from Nicholas Copernicus University (Poland). I cooperate with the University of the Arctic (network) where I am Leader of the Sub-group of Philosophy of Law. I have intensively published in the field of axiology of law, law and morality (abortion, euthanasia etc. ), enforcement of morality by law, legal interpretation, criminal law, European law and its philosophical foundations, business ethics, legal pluralism, law and language, and indigenous rights in the Arctic, moral and political philosophy, and theory of politics. I was a Postdoctoral Researcher in the University of Eastern Finland (UEF) Law School in 2013-2015. My postdoctoral research project was titled The financial crisis as an axiological crisis: the crisis of law and the crisis of morality. I was granted a scholarship of Poland’s Ministry of Science for an outstanding young scholar in 2011-2014. I acted as a Vice-Dean in Torun School of Banking in 2009-2011 where I also worked as an Assistant Professor in 2009-2015 (PL). I was a Visiting Scholar at many universities in Europe in 2005-2016 (Oxford, Edinburgh, Cardiff, London, Navarre, Elche, Alicante, Zagreb, Minsk, Istanbul, etc.). I gave lectures based on my research at many universities abroad and belong to many international societies like the American Society for Political and Legal Philosophy. I run my own research projects both in Poland (doctoral research-project) and Finland (postdoctoral research project), and I got many “small” grants. Research philosophy and ethics, primary fields of research: In my research philosophy, I focus on the truth and interdisciplinarity. I support the use of empirical and analytical research methods. I very appreciate working in a multidisciplinary environment. My fields of research are legal theory, law and morality, law and religion, law and language, corporate governance, ethics and business, axiology of law, history of law, analytic philosophy, political, social and moral philosophy, political economy, the European Union, legal pluralism, anthropology of law, customary laws, indigenous rights and cultural traditions in the Arctic, constitutional law, comparative law, international law and politics, and ideas. Significant publications: Of my recent publications, I perceive as important: Historical and Philosophical Foundations of European Legal Culture (ed. D. Bunikowski, Cambridge Scholars Publishing, 2016/2017), and Arguments from cultural ecology and legal pluralism for recognising indigenous customary law in the Arctic (with P. Dillon), [in:] Experiencing and Safeguarding the Sacred in the Arctic (eds. L. Heinamäki, T. Herrmann, Springer 2017), and The Origins of Open Texture in Language and Legal Philosophies in Oxford and Cambridge (Rechtstheorie 2016/47). Activities in the academic community: I am active in organisation of events. For example, I was the organiser of a series of cross-disciplinary seminars on multiculturalism in the North in 2014-2016. Development (plans): My current plans are related to works I am co-editing (“private projects” with decent publishers): “The Philosophy of Polar Law”, “Why Religion? Towards a Critical Philosophy of Law, Peace and God”, “The erosion of the rule of law in Hungary and Poland”, “Law and morality in the communist East Central Europe”. Also, I want to develop a new research area – a combination of cultural ecology and legal philosophy with its application to the Arctic (with P. Dillon from UK). Other scientific qualifications: I have been Distinguished Academic Associate at the Centre for Law and Religion, Cardiff School of Law and Politics, Cardiff University, UK since 2013. It is a honorary fellowship. I have been Corresponding Member at the Center for the Study of Law and Religion at Emory University, US since 2014. 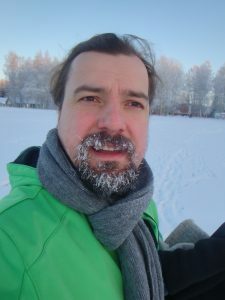 I have been Member of the Institute for Natural Resources, Environment and Society and of the VERA Centre for Russian and Border Studies Network (Joensuu) since 2013. I have been Associate Member of the Council for Research in Values and Philosophy, Center for the Study of Culture and Values, Catholic University of America, Washington since 2015.